This is a special issue indeed, a disc from a Swiss label directed and produced by two Englishmen and performed by an American choir. And to top it all, the textual content is a collation of poems by St. John of the Cross set to music by the Spanish composer Carlos Surinach and five others, three from Britain; Geoffrey Burgon, Alan Ridout and Sasha Johnson Manning, one from Australia, Clare Maclean and one from Switzerland, Carl Rutti. The programme is interspersed with saintly motets by St. John's Spanish contemporary composer, Tomás Luis de Victoria. The text of 'An den Geist' (track 11) is by Rainer Maria Rilke, but this is very much in conformity with the metaphysical writings of St. John. 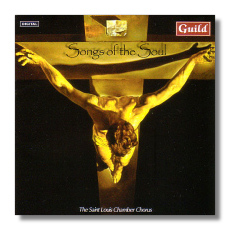 The literary objective of these choral pieces is out to express with great intensity, the soul's desire for faith and meaning, and its struggle to attain that mystic union with God. I must point out that the motets by De Victoria are only included to give a more balanced flavour to the rest of the other pieces which include a strong, often disturbing message. St. John of the Cross is one of the Catholic Church's greatest saints and was a contemporary of St. Theresa of Avila, and they both worked tirelessly for the renewal of the Carmelite Order. Both have been declared Doctors of the Church, but somehow, St. Theresa's fame seems to have outlasted that of her famous contemporary. His writings are saturated with a certain divine wisdom that is quite extraordinary, and are considered extremely deep and ecstatic. The poems under scrutiny are a series of writings describing the soul's love for God while using the language of earthly love. A contradiction maybe, but it is this odd mixture that makes them all the more captivating. The St. Louis Choir under the direction of Philip Barnes perform these works with insight and affinity. All this, added with the exquisite balance and rich sonorities that the choristers achieve, make this disc a most welcome if slightly unusual issue.